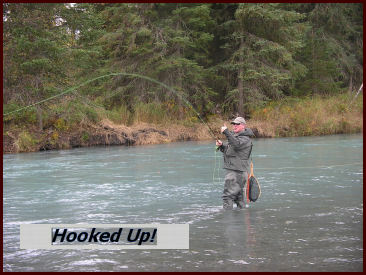 Alaska offers many different angling opportunities. The Kenai is arguably Alaska's most famous fishing river and best known for its runs of giant King Salmon (Chinook). The world record King was taken here in 1985 and weighed over 97 pounds. While the Kings draw many anglers to the Lower Kenai, fly-fishers typically focus on the Upper Kenai and the numerous rainbow trout. Fish over five pounds are common. Larger rainbows to twenty pounds or more are landed yearly. In addition to the rainbows, Dolly Varden are plentiful with many caught weighing four to six pounds. Sockeye (Red) Salmon arrive in huge numbers in mid June and from mid July through August. During large runs, the Sockeye (Reds) have returned to the Kenai in numbers exceeding one million fish. Silver (Coho) Salmon join the fray from early August into the winter season. Many consider Silvers to be the best of the salmon species to target with a fly. Flowing from 20-mile long Kenai Lake to Cook Inlet, the Kenai River drops 430 feet on its 82-mile course to the ocean. The 17 miles of river between Kenai Lake and 18-mile long Skilak Lake is known as the "Upper Kenai". This section is where most of the fly-fishing takes place. Alaska State Parks manages a boat landing right off the Sterling Hwy where the river flows from Kenai Lake. The Upper Kenai is drift only (no power boats). This adds immeasurably to the quality of the experience. Joining the Upper Kenai at river mile seven is the world-renowned Russian River. This is perhaps the most famous salmon fishing location in the world. Many sockeye salmon swimming up the Kenai enter the Russian River and spawn throughout its system. Access to the Kenai/Russian River Confluence can be easily attained through the "Russian River Campground" or by taking the "Russian River Ferry" across the Kenai. When the sockeye are running strong during mid summer, expect to see hundreds of anglers trying to seize these tasty salmon at the Kenai/Russian confluence. Adjacent to the confluence and just off the Sterling Hwy is "Sportsman's Landing". This is the most popular launch site where anglers often begin drifts to Jim's landing. The reason is simple. The next five miles of river are usually full of fish. After converging with the Russian, the Kenai braids into several easily fished side channels. Although the flows are deep and swift in the main channel, gravel bars can provide easy wading. Almost the entire river throughout this stretch contains prime spawning habitat for salmon and food for trout. After "Jim's Landing", the river drops into "The Canyon." This three-mile stretch of Class 2-3 whitewater has some interesting fly-fishing opportunities and holds some huge fish. The last two miles of the upper river above Skilak Lake provide some of the best fly-fishing water in the state. Here the river again braids into several channels and sloughs. The main channel contains many partially submerged gravel bars. Rainbows and Dolly Varden will move in and out of Skilak Lake to binge on salmon fry or sockeye spawn. The Lower Kenai River flows from Skilak Lake for fifty miles before emptying into Cook Inlet. It starts out wide and slow providing excellent summer habitat for loons, nesting swans and juvenile salmon. As the river picks up speed, so does the fishing. Powerboats are run throughout the Lower River with a maximum rating of 50hp. The most common boats are specialized 20' open river sleds and semi V's. Drifting the Lower River is less common, but is an excellent option for low water times and in some of the less crowded stretches. The first ten miles below Skilak Lake contains excellent spawning gravel and holds many Rainbows and Dolly Varden. This stretch is popular at peak times for salmon and trout. The next twenty miles contain numerous rocks and small rapids. Partly due to these challenges, this Middle River stretch sees less powerboat activity. Portions of the Middle River offer excellent fishing at the right times. The last twenty river miles are locally known as "The Lower". The Lower is adjacent to the towns of Soldotna and Kenai. This is where the most concentrated fishing activity takes place. When the Kings are running, the river is typically very crowded with boats and eager anglers. We liken it to the "Super Bowl" of King Salmon fishing. The Kenai is a wonderful river. Fishing the "Upper River" in the Cooper Landing area with the spectacular backdrop of the Chugach Mountains is what Alaska is all about. Considering the rising costs of destination fly-in lodges and outpost camps, it is no wonder the Kenai is a popular river. 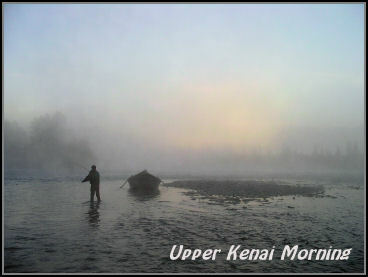 The Upper Kenai draws anglers because it is accessible (100 easy miles from Anchorage), holds sizable fish, and has a relatively long fishing season. Much of the river parallels the road as it travels through the "Chugach National Forest" and the "Kenai National Wildlife Refuge". For those wishing to get away from the road, the five miles above Skilak Lake wind through a canyon gorge and offer a remote wilderness trip into the heart of the refuge. The "Lower Kenai" adjacent to the towns of Soldotna and Kenai continue to draw the majority of salmon fisherman. They seek out record sized King Salmon on guided powerboat trips. For those wishing to catch these giants, the "Lower Kenai" is the place to fish. Fly-fishers and anglers wishing for a little more solitude and scenery can find their place on the Upper Kenai. The plentiful Rainbow Trout, Dolly Varden, Sockeye and Silver Salmon keep things interesting.